Now this, is not the kind of dish I usually make. Or the kind of dish I’ve been known to make. Or the kind of dish I would even consider make a few years back. But things are about to change around here. Or so it seems, because this was freakin’ delicious! I’m also more of a creamy white sauce person when it comes to pasta. Besides, I’m more of a meat or chicken person when it comes to meat. Meaning, not ground meat. So that this dish would do it for me, wasn’t really expected. My boyfriend however, loves this stuff. So much that whenever -literally- I ask him what he wants for dinner, it’s spaghetti bolognese. Always. And I always turn him down, the poor thing. That’s not what I want. At least not the way he makes it. (Sorry!) But when I saw this dish on Pioneer Woman I thought I would give it a try, and be a nice girlfriend. But if I’m making something I normally don’t like, it oughta be good. If you know what I mean. Judging by the photos, I had faith. It actually looked really good. There was something very appealing about those round meatballs, and making them turned out to be very therapeutic. As was eating them… I’ve never made it before, and replacing meat with balls of meat never occured to me. But it was a lot better, so I’m not going back! It was so slurpy delicious, I actually skipped the salad. But next time, cause there will be a next time, I’ll serve it with a caesar salad and garlic bread as PW suggests. Adding garlic bread can only do good. The dish was really tasty, comfort food at its best. And the boyfriend was very content. 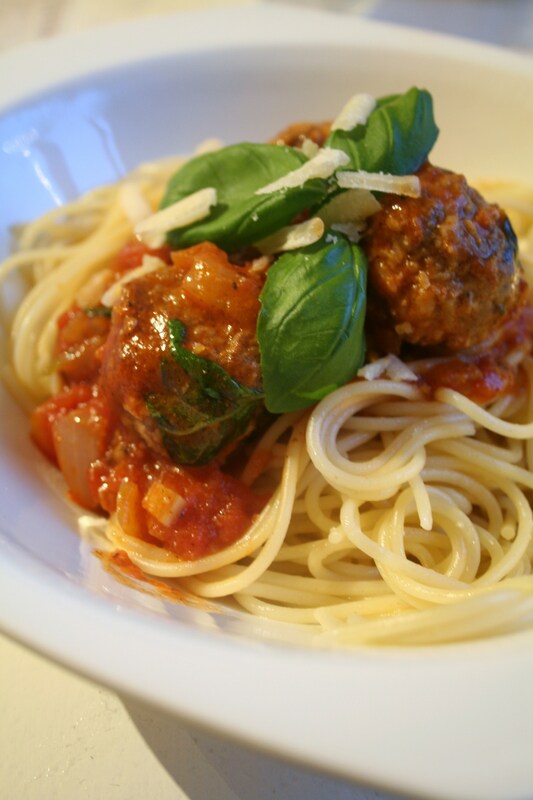 Adaptations: I used only ground beef, skipped the wine and replaced parsley with basil. To make the meatballs, combine meat, garlic, breadcrumbs, Parmesan, eggs, salt, pepper, parsley, and a splash of milk in a mixing bowl. Mix together well with hands. Roll into 1 1/2-inch balls and place on a cookie sheet. Place in the fridge or freezer for 5-10 minutes to firm up. To brown the meatballs, heat olive oil in a heavy pot or large skillet over medium-high heat. Add meatballs 8 at a time, turning to brown. Remove and drain on a paper towel after each batch. Set meatballs aside. In the same pot, add the onions and garlic and cook for a few minutes. Pour in whole tomatoes, crushed tomatoes, and wine, if using. Add salt, pepper, sugar, and parsley. Stir to combine and cook over medium heat for 20 minutes. Add meatballs to pot and stir in gently. Reduce heat to a simmer and cook for 30 minutes, stirring very gently a couple of times during the simmer. Just before serving, stir in basil if using. 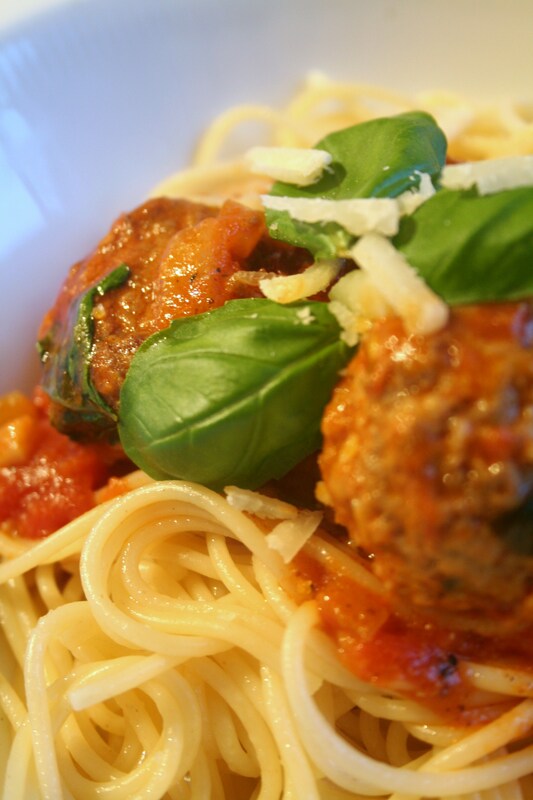 Pile on the meatballs over a big bowl of cooked spaghetti. Serve with garlic bread and a caesar salad. Sprinkle with extra Parmesan. Enjoy! I’ve been really into risotto lately, and it doesn’t seem to end any time soon. I just love that creamy, soft rice together with mushrooms or whatever it is that you put into it. But I must say, mushrooms are a great companion with arborio. I bought a can of – canned mushrooms the other day, and once I saw it there in the shelves, I thought of risotto. Just one of those moments when two apparedely separate things come together as one. I could picture this risotto right there, in the isles of the supermarket. I picked it up. It was meant to be. When I got home, I put it away with the rest of my canned food, and I forgot about it. But yesterday I rediscovered it. I was looking for something to make for dinner when I found it, and it all came very clear. I was making mushroom risotto. And that’s exactly what I did. First you make the broth. Whether it’s with real fresh vegetables or a boullion. (I like to use some fresh leak or onion anyway, to get some more taste to it. This time I also used the water from the canned mushrooms as well, it gave a sweet mushroomy smell.) Bring to the boil. Cut the fresh mushrooms, and fry they until they turn soft and golden. Remove from pan. Slice the garlic and onion into small pieces, and fry for about five minutes. Reduce the heat. Add the rice, and stir until you see the ricegrains turn transparent. Keep stirring all the time, because they can burn quite easily. This should only take a minute or so. This is where you should add the wine (or vermut can be used), and stir until all is absorbed and all the alcohol is steamed off, but I didn’t have any white wine, so I skipped to the next post. Which is start adding the boiling broth. One spoon at a time. Start with the heat on a medium level, and eventually turn it up after some time. Let all the broth be absorbed before adding a new. And stir. And with one hand add another spoon of broth, and with the other hand, stir. Repeat this until the rice absorbs enough fluid to become soft, but with a slight chewy center. Have you come this far, you’re almost done. Add the fresh and canned mushrooms. Add a knob of butter, how much is up to you, but is should be at least 30 grams, and freshly grated parmesan. Stir this in rapidly, almost whipping it into the rice to make it velvety and creamy. Add more cheese or butter if you feel it needs more. Taste with salt and pepper. Serve once it’s finished with some freshly grated parmesan. And that’s it. That’s the story of a can with mushrooms.